Welcome to the 62nd gallery of Black and White Wednesday, now presided over by lovely Cinzia of Cindystar. Cinzia herself will be hosting #63, a special Christmas edition of the event next week on December 19. Thanks to all who have joined in with their stylish B/W photographs. I never tire of them. 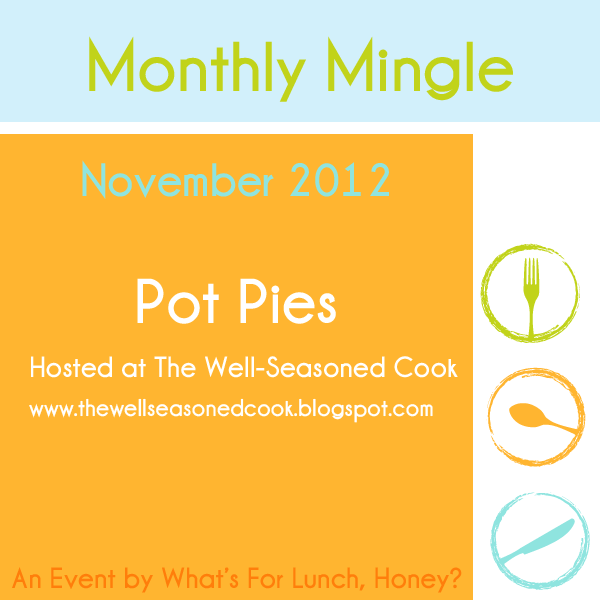 It gives me great pleasure to present an array of savory and sweet recipes featuring the November Monthly Mingle theme of Pot Pies! Filled with meat, fruit, or vegetables, a simple casserole takes on new depths to stab a fork into when covered in a crust of pastry. For those unfamiliar with the pot pie, wiseGeek has one of the best explanations of the dish's genesis and evolution. The frozen pies, a staple of my very austere childhood, have long held a great nostalgic value for me as one of the ultimate comfort foods, sharing equal billing with macaroni and cheese, and crinkle-cut French fries. Thanks to all who joined in during these very busy times of holiday preparations, travel, and celebrations. And special thanks to Meeta, creator and torchbearer of the long-running Monthly Mingle event, for allowing me the opportunity to look back fondly on those far-away days when there was something baking and bubbling in the oven in a season of ironclad skies, damp chill, and frost-patterned windowpanes. Please let me know if there are any omissions or corrections, and I will update as soon as possible. Simone of Junglefrog Cooking is hosting the December edition of Monthly Mingle. Köstrizer Beef and Mushroom Pie - Meeta - What's for Lunch, Honey? Since approximately seventy-five percent of American households enjoy the traditional side dish of frozen green bean and mushroom soup casserole topped with a toss of those bits of funky canned, frizzled onions, I will refrain from singing to the choir and not present the recipe for it here. I can guarantee that a Google search will pull up hundreds, if not thousands, of results. Yet there is another American culinary institution, the pot pie, that is an ideal vehicle to rid yourself of those lingering festive-feast leftovers without resorting to surreptitiously scraping the mass of vegetable-spiked creamy mayhem into the dustbin. Waste not, want not. After all, it's not that it's beyond redemption, but it could do with a makeover. Concealed beneath a leavened layer of pastry embedded with those cult-favorite onions, last week's wickedly rich recipe returns as this week's luxurious, little lunch. The scratch crust, from one of my favorite cookbooks, is a dream of ease and pliability. You cannot miss for the making of it, although given the largesse of the recipe, you will find yourself with yet more leftovers. So roll, cut, and bake yourself some tender home-style biscuits with the dough, splitting the difference with a patch of melted butter. Preheat oven to 350 °F. In a large saucepan, gently reheat the leftovers. Turn off heat; reserve. In a large bowl, mix all dry ingredients together. Working quickly with your hands, rub and toss fats into the dry ingredients until the mixture resembles evenly coarse meal. Make sure you work out any obvious lumps. With a large spoon or rubber spatula, beat in milk 1/4 cup at a time, making sure that you mix well after the last addition to ensure that dry ingredients are all incorporated. Let rest for 5 minutes. With floured hands, gather dough into a soft ball; it will gather easily and hold its shape well. Place dough on well-floured surface and roll it to 3/4-inch thick. Invert 3-4 cup oven-proof baking dish over rolled down, pressing down and turning to cut a perfect circle or square. Wipe dough off edges of dish. Fill dish with reheated leftovers. Carefully lift cut dough and place on filling. Although this recipe works with nearly any seed legume, the uniquely briny bite of lupini beans holds its own against a sprinkling of equally potent dried rosemary. So easy to prepare for as a snack, you can make it easier and safer still to purchase a jar of already processed-for-consumption beans. I mention safety not for the obvious precautions of working with hot fat, but for the equally diligent process of soaking the fresh or dried beans in salted water over a period of days to remove their natural alkaloid content, an element that makes for bitter, as well as toxic tasting. If you choose to prepare your own, it is critical that you are patient and painstakingly particular in the methodical soaking; there are no shortcuts. You can, however, opt to forgo removing the dense outer skins of the beans, each punctuated with one tiny whole from which the entire seed can be popped. The quick trick is to hold each bean in a damp paper towel and squeeze it between thumb and middle fingers, snapping it out into a well-positioned bowl. While this may seem as time consuming as soaking, it can actually be a pleasant, fidgety ritual of therapeutic value. To skin or not to skin is at your own discretion. To resist another crunchy handful is that much harder a choice to make. Drain and rinse beans under cold water in a colander. If you are leaving the skins on, tip beans into a tea towel to absorb excess moisture before opening the towel to allow beans to air dry. Any moisture introduced to hot oil will cause spattering that can result in painful burns and more difficulty in regulating the oil temperature. If you are removing the skins, follow the technique above, changing the paper towel when it becomes too wet. Proceed to dry beans as just described. This recipe is for Simona of Briciole, hosting MLLA 53, which closes today at noon California time. Thanks to Simona for hosting, as well as all who have joined in this month. After all these years, it is still a treat to scroll through what are now thousands of legume recipes from creative cooks all over the globe. If you are still feeling full and feeble after last week's hours of holiday cooking and eating, a bowl of beans that tastes creamy and rich with nary a drop of dairy, is just the healthy remedy heading into Round 2 of the celebratory feeding frenzy, also known as December. Although pinto beans, with their soft, easy-to-mash texture, are a common choice for this Mexican dish, don't be shy about using black, pink, or white varieties. In lieu of refrying the beans in a generous amount of fat after cooking them down, I added more water to soup them up. Epazote, culantro, and pasilla chile peppers can be found in Latin markets. In their absence, substitutions of oregano/thyme mixture, cilantro, and a teaspoon of smoky chile powder reasonably replicate the flavors. Doubling the recipe will do no harm, especially if you consider the likely possibility that you will make a meal of it all to yourself. This recipe is for Sra of When My Soup Came Alive who hosted MLLA 52 in October. You can find Sra's round-up of delicious legume-centric fare here. Many thanks to Sra and all who participated. Simona of Briciole is hosting the current MLLA 53 for November, an abbreviated version of the event. There is still time to join in; the deadline is tomorrow, November 30 at noon California time. Simona will be happy to welcome your recipes. For Anu of Tomato Blues, hosting Black and White Wednesday # 57, the weekly culinary photography gallery now presided over by the very gracious and talented Cinzia of Cindystar. Since Cinzia has recently taken over officiating BWW, she has lent her own special style to the event by inaugurating some holiday-themed editions. She has also been enthusiastic in ensuring that future hosts are booked well in advance. Since there is a new gallery every week, there is always a spot open, so do consult this page for full event and hosting details. 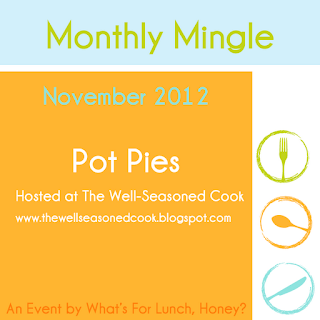 November Monthly Mingle Announcement - Pot Pies! It delights me to announcement that Meeta K. Wolff's Monthly Mingle is being hosting here for the month of November. With the last of the leaves dropping from trees to reveal gray, somber skies, and temperatures dropping to the edge of freezing more frequently as autumn progresses, wouldn't it be cozy to have something comforting, rich, and flavorful baking in your oven? Then it's time to get your rolling pin out to fashion a crust of pastry to seal a deep dish of stew or compote for the makings of a classic pot pie. Though a pot pie often is also lined with a layer of pastry to hold in and absorb every drop of delicious sauce from the filling, it is not essential that your contribution be completely encased. It's not even necessary that your recipe be made with homemade dough or a traditional short-crust lid; groceries carry prepared, pre-rolled discs, or your top could also be made with easier-to-prepare biscuit dough. What is a must, though, is that your crust fully cover the filling, in addition to being prepared in a pie dish, ramekin/s, or casserole that is at least a few inches deep. This specific depth and pastry top distinguishes the pot pie from a more delicate, shallow tart with an open top. The choice of filling is entirely at your creative discretion. It can be savory, sweet, or both (in the style of Medieval and some Middle Eastern recipes). Vegetarian, vegan, and non-vegetarian recipes are welcome from any culture. If you have never made one before, it is helpful to ensure that gravies or sauces are fairly thick to avoid excessive spillover while baking and keep the top mantel light rather than leaden. So, come break crust with me and Meeta through November 30. I will have the round-up online within days of its close. Here are the brief, easy-to-follow rules which Meeta has set forth. Please direct your posts to thewellseasonedcook AT yahoo DOT com with Monthly Mingle in the subject field. Do also include an attached photo file approximately 400 pixels wide which I can add to highlight your recipe. Thanks to Meeta for giving me the opportunity to host this very popular, long-running event. And big thanks to you for sharing your talented recipes. An easy recipe for any time of day, these moderately spiced pancakes deviate slightly from Lisa's traditional roti flatbread by way of a few rushed errors, yielding loftier results more akin to American-style flapjacks. The results, while unexpected, were not unwelcome. They did, however, beg to be served as the centerpiece of the meal rather than as a accompaniment to sop up last drops of divine curries. Spoonfuls of ghee replace pats of butter, and a whisking of yogurt, milk, and chutney play the pour of maple syrup. Would I find this at my local diner or Indian buffet? I doubt it. But the accidental fusion stacked up just right. Chickpea and Fenugreek Pancakes with Melted Ghee and Yogurt Chutney Syrup - Marginally adapted from Lisa's recipe. In a small bowl, cover fenugreek leaves in warm water to soak for 15 minutes or until leaves are soft and expanded. Drain off water. Reserve leaves. In a large bowl, mix all dry ingredients together with a whisk. Add water, yogurt, and reserved fenugreek leaves, whisking more vigorously to produce a smooth, fairly loose batter. Cover bowl with foil, plastic wrap, or a plate, and let stand for 30 minutes. Batter will be thicker and aerated from the baking powder. Warm a few drops of ghee onto a skillet over medium-low heat. Using a pastry brush, spread the ghee to cover the cooking surface to prevent sticking. Let skillet temperature rise for 1/2 a minute before pouring batter by 1/4 cup measures in. Do not overcrowd, but cook in batches, spreading the batter out in a circular motion with the back of a spoon to ensure even thickness. Cook for 2 minutes, or until top batter is bubbly and edges are dry. Turn and cook raw sides for another 2 minutes. Repeat the process with remaining batter, ensuring that you grease the skillet each time with more drops of ghee. Reserve pancakes on plate tented by foil to keep them warm as you continue. This recipe is for Jaya of Desi Soccer Mom who hosted My Legume Love Affair #51. You can find her round-up here. Sra of When My Soup Came Alive is hosting MLLA #52 with an extended deadline of November 11. Thank you to both Jaya and Sra for hosting, as well as all participants who join every month. The November host will be announced shortly. This is old-time America, fifty miles west of New York City. We call it God's Country. New Jersey is also officially known as The Garden State, too, for good reason, although most folks only see it when passing through the ugly industrial sprawl from Newark Airport to other destinations. There is so much more to New Jersey, my home state, than a corridor of transit on the miserable New Jersey Turnpike. Most would be surprised to know that New Jersey glories to the most affluent and secluded old wealth of the nation. It's not Silicon Valley, which is new wealth, and not nearly as prestigious. This is Millicent Fenwick territory. There are more than a few first-tier prep schools here. And though I am not personally fond of riding with the hounds, I spent two years living among the hack set with the U.S. Equestrian Headquarters only a half mile away. Once off the interstate, I've long known there were treasures to frame and record. I've been in these parts since a teenager, but only now, as a photographer, do I embrace the by-gone days that are slowly fading from view. A culture lost is a culture to mourn. This is my contribution to Black and White Wednesday, hosted this week by the very talented Lynne of Cafe Lynnylu, and presided over by Cinzia of Cindystar. For Cinzia of Cindystar, I drink to her good health as new administrator of Black and White Wednesday - A Weekly Culinary Gallery. This photograph is my contribution to her inaugural gallery, scheduled for publication tomorrow, Wednesday, October 10. Since I have passed the reins to her talented and capable hands, Cinzia has already scheduled much of the guest host roster for several coming weeks. Despite no longer presiding over the weekly festivities, I will be joining each week as a participant, as well as popping in for occasional hosting duties. Though it was time for me to move on from the event that I created, black and white photography will never lose it luster for me. If you feel the same way, I'm sure Cinzia will welcome your images with the same enthusiastic and admiring spirit which I have over the last year. Thanks again for sharing your generous talents with me. Let's look forward to another year of Black and White Wednesday, now also concurrently presented by Cinzia in Italian. I thank her for accepting the leadership role and adding her own special touches to its continued success. It's been a full year of galleries today, as Black and White Wednesday reaches its fifty-second week. And while it is a celebration, it is also a passing on of the baton to another blogger who has graciously accepted the offer to administrate this event going forward starting with next week's gallery. My online life is at a crossroads now and will be focusing on a new adventure in the near future. The Well-Seasoned Cook, however, will continue to be a presence in the food community, and My Legume Love Affair is expected to play out at least through 2013. I also expect to participate in BWW for as many weeks as time allows. Cinzia of Cindystar will be the new go-to gal for all things BWW. I am currently transitioning event-related matters to Cinzia so that she will be up and running for next week's gallery. Although the host for next week has not yet been confirmed, you can expect an announcement here, as well as on Cindystar, in the next few days should you want to participate. For those who are already booked to host, you can be assured of your scheduled weeks. Please give Ci a warm and hearty welcome in her new role as Mistress of Monochrome. Thank you all so very much for sharing your joy of black and white culinary photography with me. Although I'm running very late, it gives me the greatest pleasure to present your talented and generous recipes for My Legume Love Affair #50. Thank you very much for your patience and delicious contributions. Please leave a comment if I've made an error or omission that needs correcting. Jaya of Desi Soccer Mom is taking latecomers for September's MLLA #51 through October 5. Sra of When My Soup Came Alive is hosting MLLA #52 for October and will be announcing within the next few days.